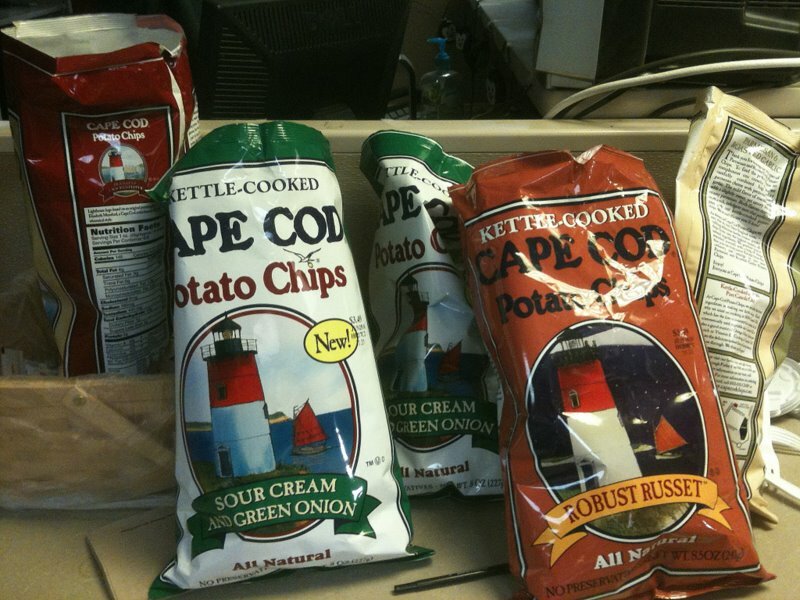 These were Cape Cod Potato Chips–The Halle Berry of chipdom! Oh yeah. Halle Berry–beautiful and alluring and yet the relationship never ends well! I fell off the wagon tonight. I’m not proud. Where was my willpower when I really needed it? The potato chips were there when I walked into the newsroom this afternoon. This kind of stuff happens. There’s a guest on the noon show or a reporter is in the right place at the right time and all of a sudden treats appear. Newsies are selfless that way. And these weren’t run-of-the-mill chips. These were Cape Cod Potato Chips–The Halle Berry of chipdom! Oh yeah. Halle Berry–beautiful and alluring and yet the relationship never ends well! I walked by again-and-again unconsciously thrusting my arm deep into one of the open bags. I had some this afternoon. I had more tonight. “Aren’t you worried about germs?” Darren Kramer, a man of unwavering willpower and impeccable hygiene asked. No, no. Chips trump all health concerns. After all, they’re chips! Hopefully by tomorrow other newsroom leeches will have emptied the bags. I’ll be able to return to my carrots and Diet Pepsi. Tonight I’m a broken man. Please, don’t tell the scale. If you don’t want to vote–don’t. I watched most of Saturday Night Live tonight starting with the cold open. Earlier today I’d read a reporter on the political trail with John McCain who said McCain was starting to look tired. That was not evident tonight. Say what you will about politics and policy–this was a gutsy move for McCain and i think he was rewarded by a script that was, by and large, complimentary to him and his cause. And he showed a good sense of humor… or more succinctly, didn’t seem like the “Hey you kids, off my lawn” old guy he’s often portrayed as. Maybe I’m too politically immersed this season, but how can anyone still be undecided? The candidates, their policies, their styles–totally different. It’s a young, liberal, black guy versus an old, conservative, white guy. Have we ever seen that before on a national stage? I worry about the undecided. Are they conflicted or just so removed from the world around them their indecision is a product of their lack of knowledge. How much racism is involved? I know it’s there, but I suspect it’s inconsequential. I’m not saying there aren’t large numbers, but these people wouldn’t have voted for any Democrat. Every year at election time, but especially for the presidential elections, there are get out the vote drives. I’m a non-believer. The real goal should educate the vote. Why do we want people to vote out of a sense of guilt? Shouldn’t voting be motivated by intellectual conviction? Blogger’s note – A long comment that was originally attached to this entry has been deleted. It was heavily in support of John McCain. I have no problem with that. However, I removed the message because, as is pointed out below, it was not original content and has been posted on dozens of other sites. My policy is original content only. Helluva scoop if it were only true. The big buzz in media (all media, not just TV) is user created content. It’s free–what’s not to like? Helluva scoop if it were only true. I’ll let a professional writer pick it up. This is from the Washington Post. A false Internet report that Apple’s Steve Jobs had suffered a heart attack briefly slammed his company’s stock and raised fresh questions about the delicate relationship between traditional and new media. The posting on iReport.com — a citizen journalist site owned by Time Warner’s CNN — is the most recent incident in which a faulty online report created brief, but wrenching, confusion among investors. Apple quickly denied the report about its chief executive, but not before its stock dropped more than 2 percent, hitting a 17-month low of $94.65. It later recovered, climbing as much as 4 percent, before closing at $97.07, down 3 percent for the day. CNN has tried to distance itself from the iReport site and its ‘reporters’. That’s going to be tough. It’s CNN’s cred that keeps the site active. In the last month CNN used nearly 1,300 iReport submissions which encourages even more participation. Having journalism performed by actual journalists doesn’t guarantee accuracy, but it seems to be a step in the right direction when you supervise the reporter and he/she is answerable. Citizen journalists are not. Actually, that’s not totally true as the Steve Jobs heart attack citizen journalist might be answerable to the SEC. Last September I wrote about my upset with Fox News ‘assigning’ a story to viewers. I didn’t say it was FNC but why hide it. [T]oday I also watched an instance of what I don’t want to see with cellphone video. I’m not going to say which cable network it was, because I can’t find anything about it on their website, and it just might be ‘freelancing’ by a producer or anchor. The anchor showed a still from an air show, mentioned where one was taking place today, and asked for viewer video. Uh… isn’t that why they have reporters and camera crews? I understand getting video of spot news, unanticipated events, from viewers. This is totally different. This is an assignment. I’m not even sure a business can legally ask people to work for free, can they? Author Geoff FoxPosted on August 13, 2008 Categories UncategorizedTags Chicago, CNN, Columbus, David Folkenflik, his/her equipment, Jon Klein, journalist, journalistic product, mainstream media, Miami, Mike Sechrist, National Enquirer, Ohio, Orlando, president, reporter, San Francisco, Seattle, senior executive editor, Steve Plamann, The National Enquirer, the Wall Street Journal, United States, Wall Street Journal, Washington PostLeave a comment on What Is Journalism? The struggling company has looked at the column inches of news produced by each reporter, and by each paper’s news staff. Finding wide variation, they said, they have concluded that it could do without a large number of news employees and not lose much content. As hard as economic times are for TV, they’re worse for newspapers and other print outlets. So, what do you do to get the bottom line up? I don’t know, but I suspect it isn’t this. Here’s a story from The International Herald Tribune. Michaels is Randy Michaels, CEO of the Tribune Corporation, now owned by Sam Zell, and heavily in debt. Michaels said that, after measuring journalists’ output, “when you get into the individuals, you find out that you can eliminate a fair number of people while eliminating not very much content.” He added that he understood that some reporting jobs naturally produce less output than others. Today, it seems Michaels is valuing content the way a butcher values meat – by the pound. But in the real world content is not equal word-for-word. You would hope some of the LA Times lower word count has to do with the depth its stories contain. It will be sad to see newspapers disappear. I’m afraid that’s going to happen… and sooner, rather than later. Right now, TV is incapable of providing the depth and story count papers do (though TV kills print in immediacy, emotion and a number of other categories). Few of the Internet news sites really produce their own content, and those that do seldom produce local news. My daughter and her generation don’t read many newspapers nor do they watch much TV news. No one has yet figured out how to make traditional news more attractive to them. There’s a special, scheduled for 9:00 PM, which I will be recording. But, there might be as much fun with the shows leading up to the special! After the Phillies win, Helaine decided to watch the Mets/Padres game on WPIX (aka CW11). A few promos ran for next Saturday’s “WPIX 60th Anniversary” broadcast. I remember each and every one of these series and the individual episodes. Growing up, Channel 11 was the station for kids shows. Officer Joe, Captain Jack and Chuck McCann all hosted shows on WPIX. Those days will never return. This is compelling stuff… well, it’s compelling to me. I’m in TV news. I watched the whole hour without wanting to turn away. About a week ago, I received an email from Nick Davis. It was unexpected – totally. Last year it was a pleasure to come upon your blog wile promoting the first season of a reality show my company produces about the goings-on behind the scenes of local news. As I recall, you started out skeptical about Making News: Texas Style – in particular you were annoyed by the station’s almost complete lack of attention to the more serious side of journalism – but you were, I think, (somewhat) won over by the characters by the end of the season. He’s right. I wrote a lot about the station Nick’s crew followed in Texas. I really had mixed emotions, because though some of the ‘players’ were interesting, much of what his camera’s saw showed the worst that local TV news is. I wanted to give it a peek before I wrote about the new show&#185. Again, this is compelling stuff… well, it’s compelling to me. I’m in TV news. I watched the whole hour without wanting to turn away. As was the case the last time, it’s on TV Guide Channel, sharing the screen with scrolling program listings. Hey, I used to host a science fact show on the SciFi Channel. I understand not everything is a perfect fit. The newsroom being chronicled is at the low rated ABC/Fox affiliate, WJCL/WTGS, in Savannah, GA. Whether it’s true or not, it’s claimed to be the lowest rated ABC station in America! There’s a distinction. Savannah’s a market with two other, much more well established stations, both doing news as well. I’m not sure how this one can hope to compete, especially when they’re underfunded and understaffed. Climbing in the ratings today is more difficult than ever before. Today’s viewing audience is heavily fragmented because of all the choices (TV, cable, computer, etc.) we all have. Simply put, there’s less audience during entertainment programs to promote your news. I like the news director, Michael Sullivan. I liked him from the get-go. He’s a grown-up who knows stability is key to success. At the same time, he can only pay enough for employees to consider this station a stepping stone. Reporters, please understand: Viewers don’t want to think they’re being used to advance your career! A succession of owners has left this station with bad equipment and worse morale. That’s just not good. Unfortunately, by virtue of age and experience, the staff in Savannah does not yet know no station has equipment that always works nor every tool they need. When I filled-in at ABC, live shots died all the time. We just had enough people to hide the problems until they were fixed. Tonight, I saw some reporters/anchors who ‘get it.’ This is really good news. They understand their obligation as journalists. They seem bright and willing to work. I’ve also seen at least one reporter who doesn’t get it. He’s the crime reporter, but he’s really all about himself. He doesn’t understand, people are watching his reporting to gain insight, not to help his career. The series is just beginning. I’m sure I’ll revisit it over the next few weeks. If you’re watching it too, please leave a comment. Blogger’s addendum: The email from Nick Davis shows how ‘retail’ TV has become. He literally is fighting for every viewer. I give him credit for doing everything he can to promote his show. &#185 – It’s on cable. Each episode will be repeated – trust me. I don’t belong anywhere near that list. Speaking to me is the journalistic equivalent of slumming! Last week I was approached by New Haven Magazine. They wanted to interview me for a story. Of course there are always nagging worries. Why exactly me? I don’t want to be like Dr. Joyce Brothers, emergency guest when all else fails. I asked who else had been featured. Roya Hakakian, author, Iranian ex pat. C. Megan Urry, chair Yale Physics Dept. Tonight, New Haven Magazine’s publisher Mitch Young and photographer Steve Blazo, came by. I always worry how to answer a reporter’s questions? I’m not interested in towing the company line, but I don’t want to tick off my bosses either. Anyway, everyone can tell when you’re bullshitting to stay politically correct. Who needs that? Years ago, we had an anchor at the station who was often quoted saying outlandish, foolish or even stupid things. I suppose she was sought out once reporters realized she made for good copy&#185. She’d write it all off to being misquoted, but if you read the words and closed your eyes, you could see her saying them! One question tonight came out of left field. Mitch asked, in light of Keith Olbermann’s move from sports to news, whether I’d like to make the transition to anchor? Keith Olbermann is not your typical TV anchorman. His career, though on the upswing now, has not been without setbacks and hardship. I find what Olbermann, Lou Dobbs, Bill O’Reilly and a few others do very interesting. Their job demands a skill set different from those employed by a totally impartial anchor. They also work within a structure different from conventional, and impartial, TV journalism. I don’t think local news will be moving in that direction anytime soon, so the point is moot. It was still interesting to think about. It’s a choice I won’t have to make in real life. I’ll let you know when the article is published… unless it’s incredibly embarrassing. &#185 – Don’t ask. I will never tell. However, your guess is probably correct. Helaine and I are watching tonight’s broadcast of the Pats/Giants game. Comcast has it on five channels, plus NFL Network (which I don’t buy). Before the game began, an on-field ‘reporter’ ‘interviewed’ NFL commissioner Roger Gooddell. Well, at least that’s how it appeared. Certainly, that’s how it was intended to appear. Don’t be fooled. It was not a reporter. It was not an interview. Roger Gooddell was quizzed on NFL Network by an NFL Network employee. As NFL commissioner he controls NFL Network. He is the interviewer’s boss. Which tough, embarrassing questions are you prepared to ask your boss on national television? Gooddell answered with no follow-up. This wasn’t an interview. It was a stealth press release. That wasn’t a reporter. Tonight, he was a PR flack. That NBC and CBS allowed this to happen on their air is nearly as distasteful as NFL Network doing it. Yesterday, seemingly out of the blue, Matt Drudge headed his website with an image from an upcoming National Enquirer front page. Because Drudge is archived, I can show you the page. With the Iowa caucuses two weeks away, and Edwards developing some steam, that’s a pretty provocative and potentially damaging story… even if untrue. Using Google news, I started scouting around for additional details. There were none easily found even at the National Enquirer’s site. It’s easy to write this stuff off, except I believe it was Drudge who broke the Monica Lewinsky story. Beyond that, this is not Generoso Pope’s Enquirer, breathlessly tracking Elvis at K-Mart. This afternoon, the story has slid from it’s top-of-the-page perch, but is still posted by Drudge. The John Edwards headline now links to the Enquirer’s reporting, which includes denials and a claim of paternity from Andrew Young (a former Edwards insider, not the former Atlanta mayor and congressman). With Google, it’s possible to work backwards on a story. In this case, it was like a small brush fire which smoldered for months before bursting out. There were rumors in September, published on Huffington Post (in a fascinating story “Edwards Mystery: Innocuous Videos Suddenly Shrouded In Secrecy,” where cover-up, unexpected silence and obfuscation made the reporter more, not less, curious) and other bits and pieces, mostly on thinly read blogs. That there is scant ‘legitimate’ news coverage of this story nearly a full day after it broke implies the story can’t be verified… in other words, in its original version it’s probably not true. Will this damage Edwards? Is this a political hit job or maybe the result of a ‘rush to publish?’ Or, maybe it is true. I am watching the local Los Angeles TV coverage of the Malibu Canyon fire here on my laptop. I have often been critical of local news in Los Angeles. However, today, I have nothing but praise. The copter and reporter coverage is amazing – especially when you consider each crew is putting themselves in harm’s way. These fires can turn on a dime. The people of Los Angeles are being well served by their local media this afternoon. Unfortunately, wild fires are a way of life in Southern California. Brush fires where a part of Los Angeles before there was a Los Angeles! There is little you can do to prevent them, though the impact can sometimes be lessened by brush clearance and other techniques. That being said, homes are built in places that have views to die for… literally. I’ve just watched ABC News reporter Jim Sciutto’s package from Myanmar (Burma). The story is powerfully told from a place most of us know little about. And it’s an important story. A friend emailed me the ad you see on the left. It’s for a new reality program on the TV Guide Channel, “Making News – Texas Style”. Yeah, it surprised me too. I thought they only ran character generated listings. The ad scared me. Some people already look upon us TV types as shallow or trivial. This won’t help. “Meet Jay, the station’s future anchorman and “Star of West Texas”; Bill, the longtime anchorman who worries about his recent demotion to reporter; Melissa, the reporter with a sense of humor, who’s out to prove she’s great at her job; Kara, the feisty young reporter who’s always up for a challenge; Tatum, the anchor and former Miss Texas who balances family and her career; and Jose, the news director pushing hard for his team to be #1. This news team will do anything to get their stories on the air and beat the competition. That ad represents everything superficial TV news can be with none of the substance. I’m not saying we’re teaching college level courses on-the-air, but there really is more than pageant winners and cat fighting in the newsroom. 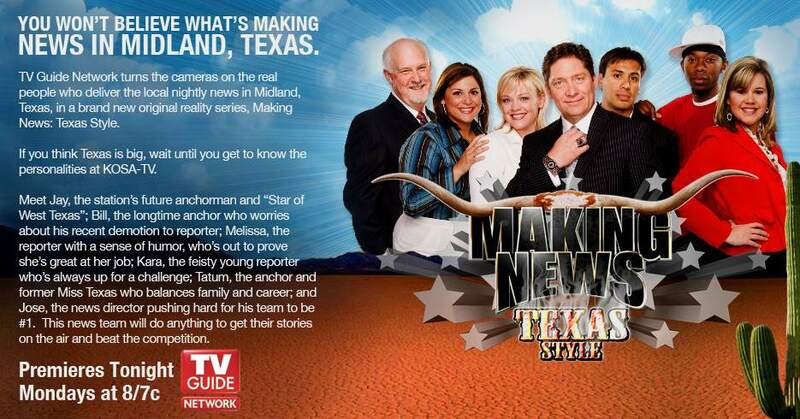 Actually, I can’t guarantee the ad’s copywriter saw the show, because “Making News – Texas Style” was a lot closer to this reserved blurb in a TV Guide press release. You probably don’t know… probably don’t care who Kitty Carlisle was. Recently, she died at the age of 96. Helaine will read this and say, “old reference.” She’s right. It’s been a long time since Kitty Carlisle was a household name – though she most definitely was. She was part of my youth as a game show panelist in the 50s and 60s. Before that, she’d been an actress of middling success. She acted, and sang in the Marx Brothers classic “A Night at the Opera.” She appeared on Broadway. She sang opera at the Met. I had no clue what her claim to fame was, nor did I care. She was a sophisticated New Yorker, dressed elegantly and on TV – a class of person foreign to my distant section of New York City. When I was a kid, I looked up to everyone on TV! She practiced singing every day, exercised every morning (and was the first to tell anyone that she had beautiful legs, which she did) and believed that discipline was the key to life. I’m not sure what proper journalism is anymore. Maybe it shouldn’t be Marilyn Berger’s place to act as reporter and expert; confirming the beauty of Miss Carlisle’s gams. I think it was sweet.